Past displays in Bromwell's window include 2015's "Making Spirits Bright." CINCINNATI -- Jim Tarbell was 6 years old in 1948 when he started coming downtown from Hyde Park to see Cincinnati decked out for Christmas. All are gone, and with them went a world of window art, the most popular of which likely was created by Shillito's at Race and Seventh streets. The crew of more than 100 industrious elves entertained thousands at Santa's Workshop through the department store's streetside windows. By 1983, the elves had abandoned the workshop, and CG&E's model train display at Fourth and Main stepped up. "Ah, the trains, of course. They were a big deal," Tarbell said. "CG&E was right behind Santa as far as having an impact on the kids of Cincinnati. There was always a big crowd there with kids on their dads' shoulders." Brent Hodge's display in Bromwell's West Fourth Street window includes products for sale inside the shop and props stored in the basement and top two floors. The trains pulled out and chugged across town to set up at Cincinnati Museum Center in 2011, passing the holiday window-display mantel to Landor, a design and branding firm located in the old Shillito's building. Now that Landor has stopped decorating Santa's Workshop windows, that mantle has been passed in part to Bromwell's fireplace and furnishings shop at 117 W. Fourth St. It's only one window, but it has become downtown's last bastion for thoughtful, entertaining and artistic holiday window fare. 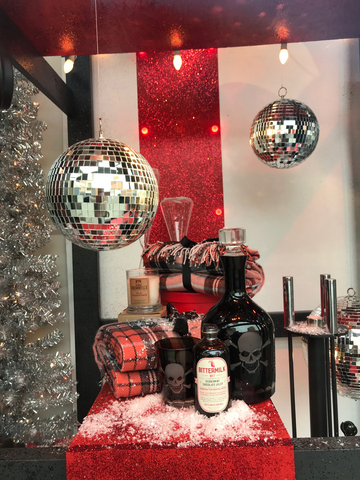 The force behind Bromwell's holiday themed window since 2014 is Brent Hodge, director of merchandising and creative at the 188-year-old retailer. Hodge grew up in Knoxville, Tenn., in the 1980s, marveling every yuletide season at the Santa Land arcade that Miller's department store created in its basement. "I loved the magic of holiday and Christmas windows," said Hodge, who lives in Westwood with his wife and three children. "I'm a child of the '80s and was lucky to get in on the tail end of that. 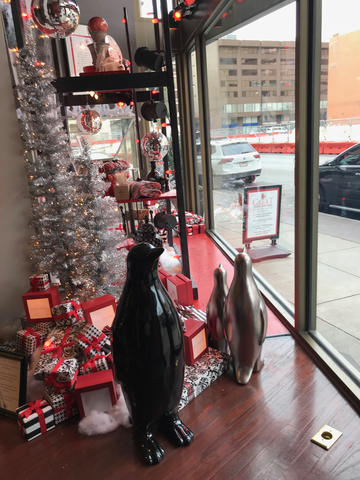 Bromwell's Christmas display includes penguins, which have been a favorite of owner Jeff McClorey for years. "Having kids, I approach Christmas like a kid does, and it kind of made me sad my kids won't have the experience I had unless I'm part of keeping it alive," he said. Hodge creates a different theme for each annual display, building "a New York window on a minimal budget," mostly with supplies and props stored in Bromwell's two-level basement and the top two floors of the four-story shop. He starts planning in August, usually scrapping his original idea and creating a deadline crunch. That's OK, Hodge said, because he said "I work better under pressure." Hodge chose "Great Expectations" to be this year's window theme. And it's a pretty heady one, unlike the tongue-in-cheek "Making His List" theme of his first major display in 2014. The idea, he said, is that "kids anticipate what's inside the boxes under the tree, not the beauty of their ribbons or bows. We adults see people from the outside, but kids don't judge people by what they look like. They judge by what's inside." Visit Bromwell's window at night and that idea comes to fore through identical red packages under a tinsel tree that flash inspirational words like "love" and "honesty." The goal, Hodge says, is to go beyond showing off a sample of the store's products in hopes that will lure customers to step inside Bromwell's and spend money. "I think people do come in to get the whole experience, and I do believe it does affect our bottom line and helps our presence on social media," Hodge said. Bromwell's 2017 window display, "Great Expectations," is the result of a monthlong sprint by designer Brent Hodge, who began conceptualizing it in August. But also, he said, "This time of year is an opportunity for retailers to give back through their storefronts. ...I wish there were a lot more of us doing it. But, on the other hand, maybe not!" 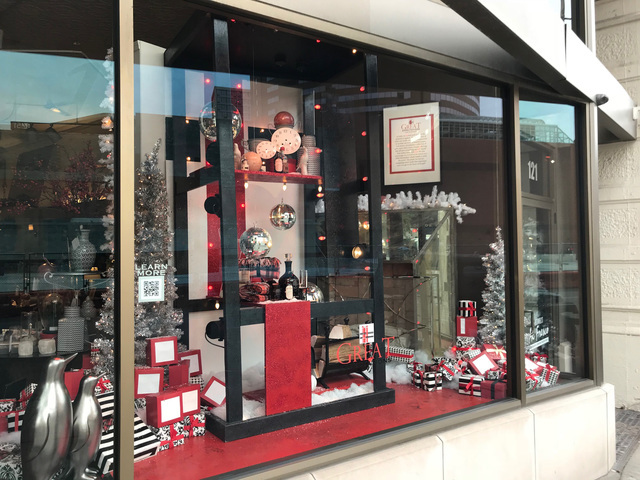 Tarbell said the dwindling Christmas spirit in downtown Cincinnati windows began with the newfound wealth and suburban flight that occurred after World War II and led to the development of shopping centers and malls outside the city. "There was this illusion of there being creature comforts in the suburbs," he said. "Everybody had a yard, and everybody had a car and could go wherever they wanted. It's understandable, but it happened with little thought of what we might lose."